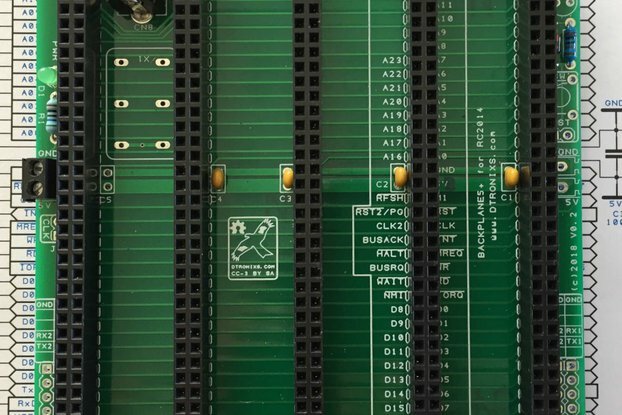 The original RC2014 was designed such that standard stripboard could be used as the backplane with all the essential signals fitting within a 36 pin bus. 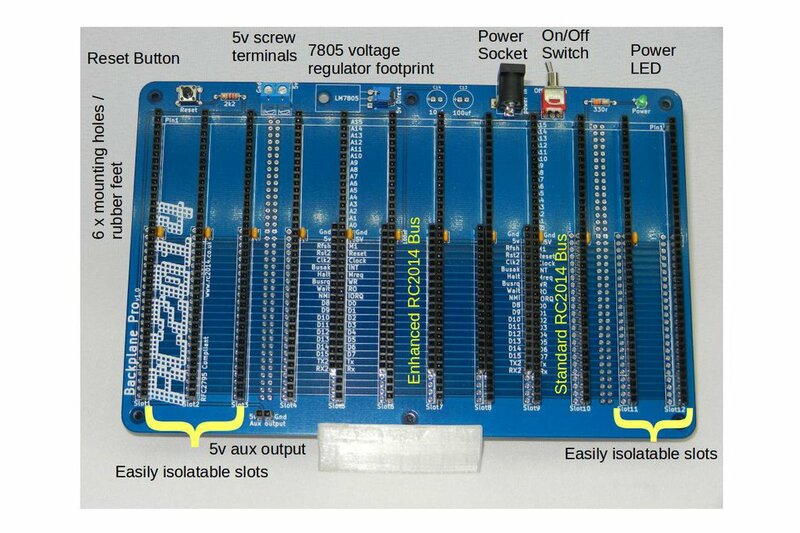 The Backplane 8, with 8 slots of 40 pins is ideal for this. For more advanced uses, however, a 40 pin bus is insufficient and 8 slots can be limiting. 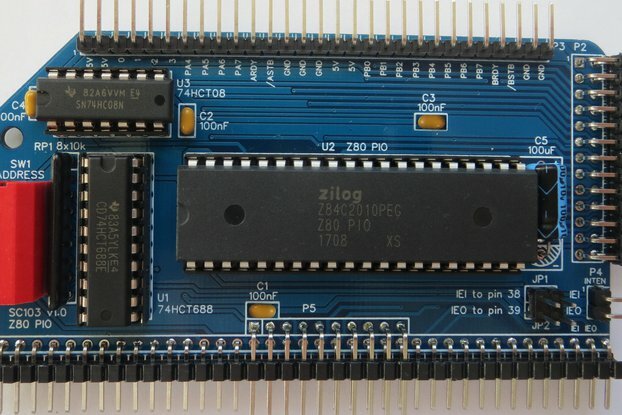 For a while, new modules such as the SD Memory Dump Module, 64K RAM Module and the Pageable ROM Module have been designed with the Enhanced Bus in mind. 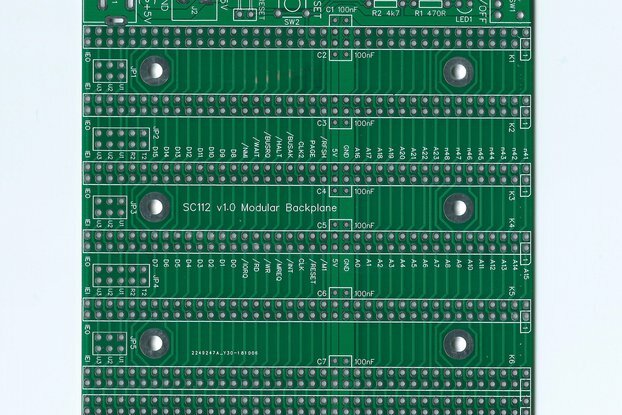 Whilst these modules can easily be connected on the standard Backplane 8 or Backplane 5 with jumper cables for the additional signals, this backplane gives a neater, more professional solution. Why would I want the Backplane Pro? Overall a very great board! The enhanced capabilities to expand to 12 boards is profound. Also, the secondary bus is great except for the limited number of 5 provided. I love the external power and the on-off switch. I also think the idea of providing wires that can be cut or left in place should be done with the 8 position back plane. Overall it is a great back plane and when I plugged in all the boards for CPM it came up nicely. As usual the PCB is of good quality with decent solder resist. I'd have preferred to have had enough of the extended connectors to fully populate the board just to give as much flexibility as possible. This could be a fault with my assembly but if I leave plugged into USB power but switched off, the cpu stops but the RAM seems to retain its contents - I need to investigate this further! I just finished soldering the sockets and am in the process of checking continuity. I think that it has been well designed and well made. I'll be using it for learning hardware development, drawing schematics, routing PCBs, and such. The Backplane Pro is a great edition to the RC3014 and will allow me to expand my RC2014 into a full blown CP/M computer when completed, which has always been my ultimate aim. Like the rest of the RC2014 products it is well made and looks the part. I am relatively new to building computers completely from scratch so plenty of information is needed by the likes of myself. There are a lot of details that I do not really understand and it would be great if there were tutorials on the hardware and software aspect; for example when attempting to install software on a CP/M computer which looks quite complex. This is a great learning tool and an enjoyable experience for me. I just hope I don't screw it up as my soldering leaves much to be desired!